WE ARE FUN, FRIENDSHIP AND LEARNING! 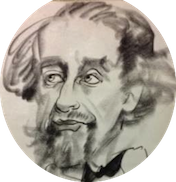 The Friends of Dickens New York (FODNY) is a literary, cultural, and educational organization dedicated to the works of Charles Dickens. Our motto is FUN, FRIENDSHIP AND LEARNING! Fun, because we get together regularly to read, dramatize and discuss the works of Charles Dickens. Friendship, because the group encourages and cements unity, understanding and cooperation among people. Learning, because great literature adds to our knowledge and understanding of one another and the world. FODNY is an official branch of the Dickens Fellowship. Founded in 1902, the Dickens Fellowship is a worldwide association of people who share an interest in the life and works of Charles Dickens. As a branch, we hold monthly meetings from September through June, taking some time off during the hottest months of the summer. At a typical meeting, we generally have one person facilitate a discussion of selected chapters of a Dickens novel. The September meeting discusses the novel’s opening chapters, and we work our way through, completing the novel in June. This year (September 2018 to June 2019) we have chosen to discuss Dombey and Son, and we have broken down our readings to align with the monthly installments as they were originally published between 1846 and 1848. It’s one of Dickens’s best novels from his middle period, begun not long after he finished A Christmas Carol and finished shortly before he began David Copperfield. With the exception of the Dickens Birthday Luncheon in February, all meetings are free and open to the public, so please feel welcome to come and join in our discussions. Whatever the word great means, Dickens was what it means.